Goshen College is a liberal arts college dedicated to the development of informed, articulate, sensitive, responsible Christians. Our integrative, international, intercultural and interdisciplinary approach to education not only prepares students for rewarding, successful careers, but also produces servant-leaders for the church and the world. 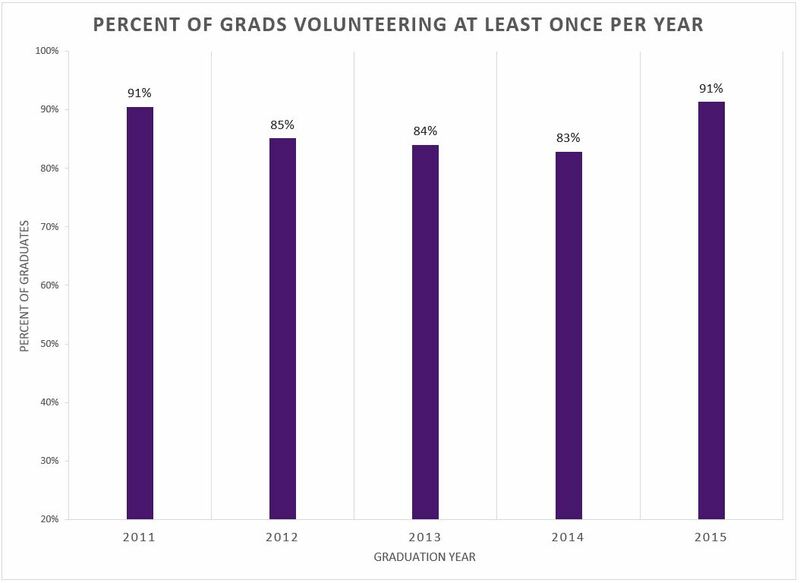 Goshen College finds consistent and noteworthy success in helping students persist and successfully graduate. National data confirm our above-average performance in both the percentage of first-year students who return to continue their studies, and in the percentage who graduate within six years. 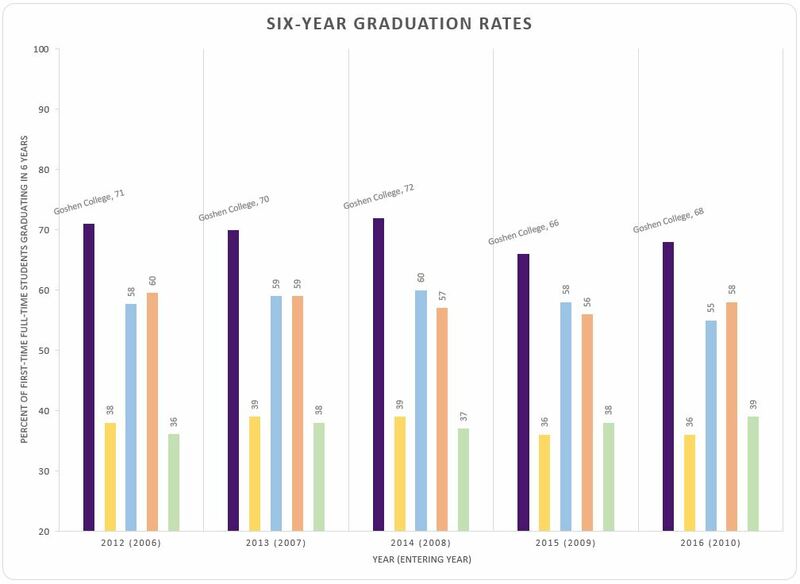 For more detailed breakdowns of graduation rates by gender & race/ethnicity see the Goshen College Fact Book. 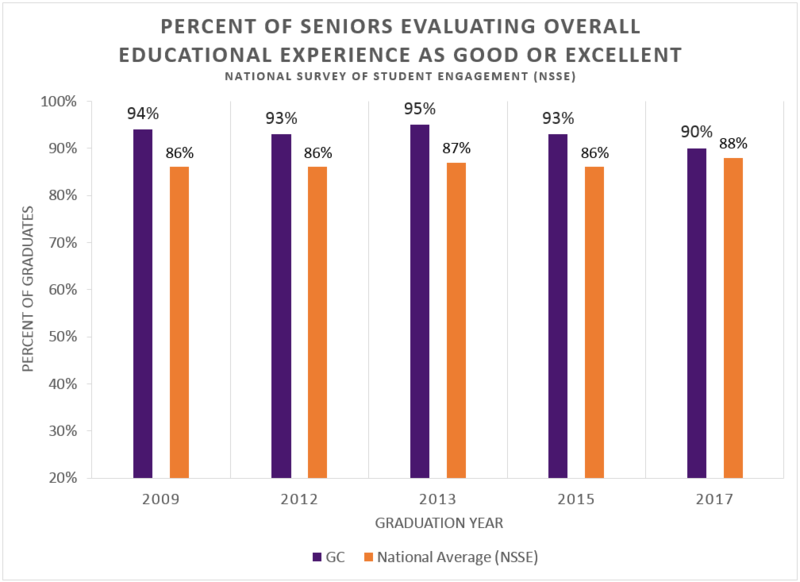 GC seniors consistently offer positive evaluations of their GC educational experiences, exceeding national averages. GC’s tradition of experiential learning, internships and research programs prepares students for rewarding careers. 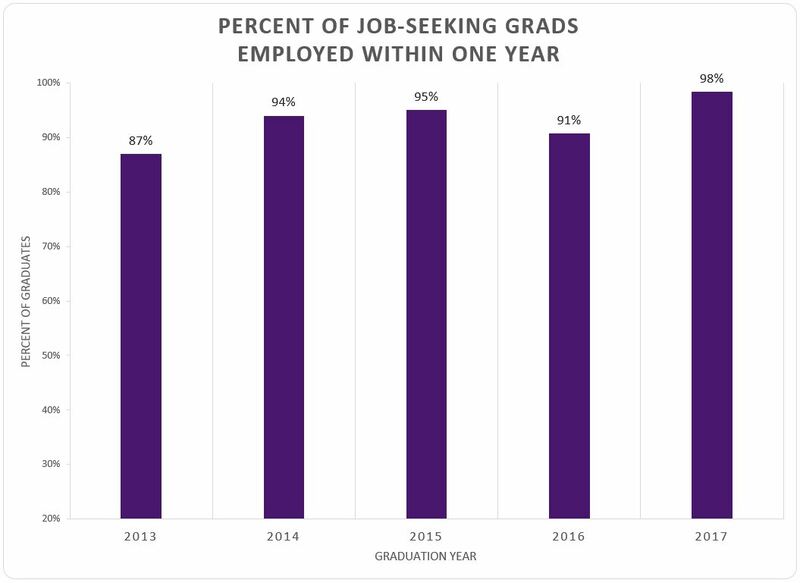 In recent years, despite the challenges of a global economic downturn, our graduates have found success in the job market. 100% of our nursing graduates pass the NCLEX exam, while we are also ranked #3 for Becker CPA pass rates, and we hold a 92% medical school acceptance rate. These skills, knowledge and responsibilities come together in a liberal arts education that uniquely prepares students for a wide variety of careers. See currently offered Majors & Minors. Goshen College excels at preparing students for doctoral degrees. When it comes to earning a doctoral degree, Goshen College students have an advantage. At GC, students have more opportunities for undergraduate research, have smaller classes and build relationships with top-notch professors both in and out of the classroom. Nationally, Goshen College ranks 93rd out of 381 Carnegie baccalaureate institutions in total number of graduates who have gone on to receive doctorates over the past 20 years. When school size is taken into account, Goshen ranks 69th nationally. 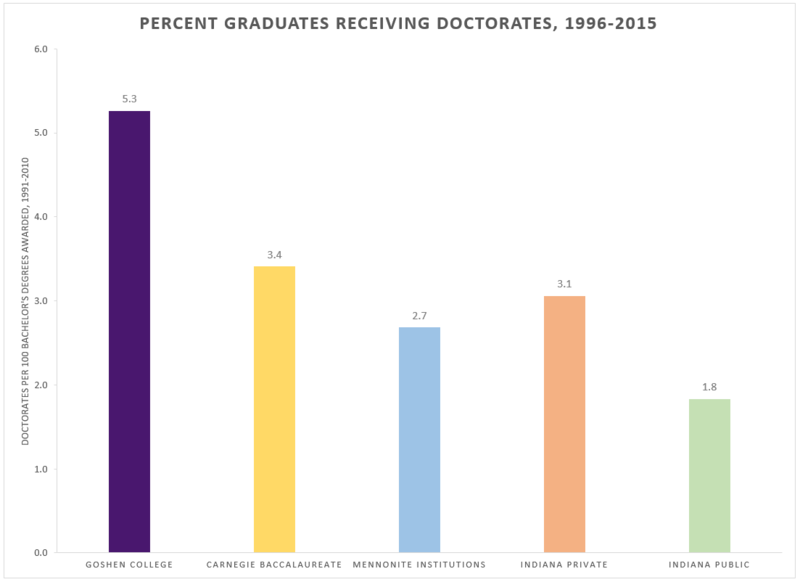 Goshen College ranks first in the number of graduates going on to earn doctorates among Mennonite institutions, with double the number of students going on to earn doctorates compared to any other institution. GC’s professional programs are known for the quality of their graduates. Our teachers, nurses and social workers are in-demand in the region. Goshen graduates are leaders in many areas of culture, service, advocacy, environment, business and science, and live out the college motto of “Culture for Service” in their volunteer and community service work. Dale Kempf ’78, helped develop one of the most potent antiviral drugs for HIV and AIDS. Ellah Wakatama Allfrey ’88 is a literary editor in England and was named an Officer of the Order of the British Empire by Prince Charles. Raj Biyani ’92 is head of the India operations for Microsoft IT, Microsoft’s largest IT operation outside of corporate headquarters in Redmond, Wash.
Steve Kreider Yoder ’81 is Senior Editor, Page One for the Wall Street Journal. Doug Schwartzentruber ’78 is a physician named to Time magazine’s 2010 list of the most influential people in the world for his cancer research. Jo Becker ’85 is the Children’s Advocacy Director for Human Rights Watch. Kelly Lerner ’85 was awarded the 2005 World Habitat Award at the U.N. World Habitat Day Celebration and named one of the top 10 “eco architects” in the U.S.
Ruby Payne ’72 is a former educator and administrator who is internationally recognized for her consulting on education and class issues. J.D. Martin ’70 has written 15 top-ten country music singles (including five #1 hits). James C. Strouse ’99 is a Sundance Film Festival award-winning writer-director of films such as Grace is Gone and The Winning Season. Scholar-Athletes: In 2016-17, Goshen College produced 44 NAIA scholar-athletes, with a total of 235 NAIA scholar-athletes over the past five years. Graduation and retention data are from the National Center for Education Statistics, IPEDS Data Center; peer groups are defined as institutions classified as Carnegie Baccalaureate Diverse Programs, members of the Independent Colleges of Indiana (Indiana privates), public 4-year institutions of Indiana, and colleges and universities affiliated with the Mennonite Education Agency. Evaluation of the overall GC educational experience is via that National Survey of Student Engagement (NSSE), which GC participates in on a regular basis with response rates above 70%. Alumni data were gathered via administration of the HEDS alumni survey. Overall survey response rates are 30-40%. Data on doctoral degrees is from the National Science Foundation’s annual Survey of Earned Doctorates. Data presented are doctoral degrees conferred between 1996 and 2015 as a percent of the total bachelor’s degrees awarded from 1991-2010 as reported to IPEDS.